Let’s say you and some friends want a relaxing getaway with a focus on cuisine and drinks, but you don’t have the time for a lengthy trip to distant destinations. If you live anywhere in Southern California, Costa Mesa may be the perfect destination for you. Located between San Diego and Los Angeles, Costa Mesa is only an hour from where I live, but during a recent day-and-a-half visit I felt like I was really getting away to a special location. Costa Mesa is less than two hours from just about anywhere in southern California and much closer for those who live in Orange County or Los Angeles. For those of you who live in other parts of the country, you may want to consider Costa Mesa when planning a Southern California trip. Costa Mesa is less than 5 miles from John Wayne/Orange County Airport and less than an hour from LAX. 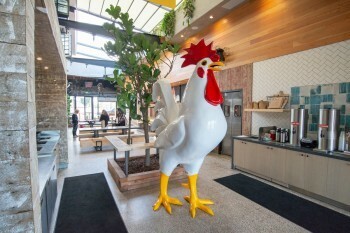 Here is a suggested plan for your visit to Costa Mesa based on my recent visit with a group of food and wine writers. You will be surprised how much fun and great cuisine you can squeeze into a brief visit, while still feeling relaxed. 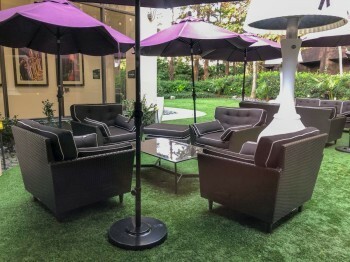 While we could easily have made our Costa Mesa visit a day trip, staying all night at the stylish Avenue of the Arts, A Tribute Portfolio Hotel, made our visit seem like we were really getting away. 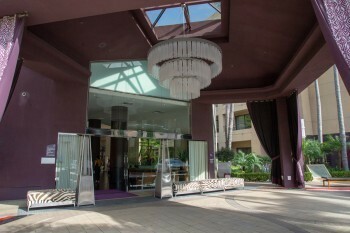 Ideally located in Orange County’s Theater and Arts District, this luxurious but affordable hotel is like an art museum in itself with striking artwork and elegant design touches throughout the hotel. Our group loved relaxing in comfortable, artistically arranged settings in the lobby. The hotel’s lovely lakeside location says “take a deep breath and let go of your stress.” The rooms were modern and also highlighted with artistic touches. And once you sink into one of the comfy beds you won’t want to leave. The hotel’s top-notch Silver Trumpet restaurant and bar serve craft cocktails and imaginative California cuisine created by Chef Hector Zamora who focuses his menu on fresh, organic, seasonal ingredients. We first headed to The Camp, an artsy, enchanting shopping and dining area—with a healthy, eco-friendly focus. The natural setting and winding paths invite you to meander around all day — and we did just that. We first stopped for a scrumptious brunch at the Old Vine Café. It was the perfect day to sit on the patio and savor some special cocktails and creative dishes prepared by Executive Chef and owner, Mark McDonald. His dishes change seasonally and have a Southern Italian twist. 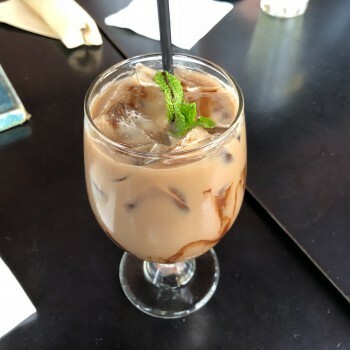 I started out with a refreshing Prosecco while others in our group enjoyed a decadent Thin Mint Iced Mocha, a Muddled Berry and Mint Mojito, and House-Made Sangria. Our dishes included a crispy Artichoke Hearts of Palm Salad (Did I say how much I love to find hearts of palm in a salad? ); Quattro Fromaggi, a four-cheese, grilled sandwich made of mozzarella, gruyere, pecorino and goat cheese with shitake mushrooms, arugula and a tangy Pomodoro sauce; Lengua Omelet, made of slow cooked beef tongue, Queso Fresco, spicy tomatillo salsa and pickled serranos; an Open Faced sandwich on a fresh biscuit with chicken sausage, eggs, chipotle gravy, Queso Fresco and potatoes; Baked Caramel Apple French Toast; a Pizza Omelet, and for dessert, strawberry crepes, and sweet ricotta mousse crepes with caramel sauce. By the way, Old Vine makes its own pickles fresh daily (much to the joy of one of our food writers who is a pickle aficionado). We were happy to learn that breakfast is served every day (not just on weekends) until 3 p.m. Lunch is also served daily and dinner is served from 5 to 10 p.m. Tuesday through Saturday. After peeking into some unique shops, we next visited the Wine Lab right next door to Old Vine, where we were amazed at the variety of wines available to taste and purchase. Our tasting room hosts were Edwinn (one of four somms at the Wine Lab) and Kate whose enthusiasm was contagious. They were both knowledgeable and enthusiastic about the wines they served us. Each week new wine selections are featured in the wine flights offered. Red and white flights are available for $10 to $16. Creatively served in test tubes, the wines we tasted were unique to us and especially appealing. Most of the wines are from boutique, small lot wineries that we might not encounter other places. Even though I am a wine writer and regularly review wines, I had never tasted any of these wines before. I particularly enjoyed the Arcangelo Verdeca 2016 from Puglia, Italy, which had mellow pear and melon flavors that would have paired nicely with cheese. Kate emphasized that the Wine Lab is a place where customers can discover new wines and learn what they like and don’t like. I have to say that I learned mostly what I liked during my wine tasting at the Wine Lab. Customers are allowed to bring in food to enjoy with their tastings and they frequently bring food from the surrounding restaurants. The Wine Lab also offers tapas, cheese and charcuterie plates, flatbreads, and other light snacks. I was happy to learn that dogs are allowed on the Lab’s patio, which is true of just about every place in The Camp. The Wine Lab is open daily, but hours vary so check the website. For us the Wine Lab was a nice break between meals. Our next stop in The Camp was Vitaly Caffè, an Italian eatery, with a focus on craft coffee, house-made gelato (to die for), and fresh authentic Italian dishes. 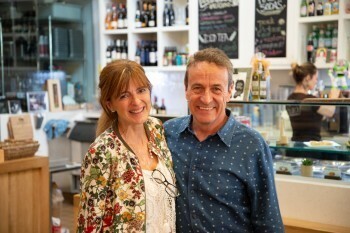 I loved the casual, friendly setting (with an outdoor courtyard) and especially enjoyed meeting the personable owners, Maurizio and Barbara Cocchi whose passion made it clear why Vitaly is such a special place. 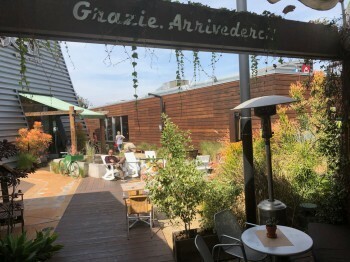 Fortunately, the Cocchis, who are from Bologna, wanted to bring their love of Northern Italian cuisine to California and they did just that in 2013. Using imported Italian coffee beans, Vitaly serves a variety of enticing coffees, including espressos, cappuccinos, caffè lattes, and many more options. 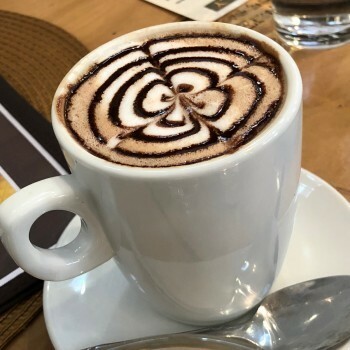 I savored Choccocino, a delicious blend of Nutella and chocolate cappuccino. We also relished a variety of creamy, luscious gelatos, which are made fresh daily. Vitaly’s pastas are homemade and so different from the store-bought pastas we usually eat. The noodles are fresh and tasty (and oh so thin) with sauces that have unique, authentic Italian flavors. I happily sampled the gnocchi and the lasagna. We also enjoyed homemade piadina (flatbread sandwiches) and cassones (warm Calzone pockets). While my mind knew we were in Orange County, I felt transported to Italy through my taste buds and also the charming ambiance of the setting. 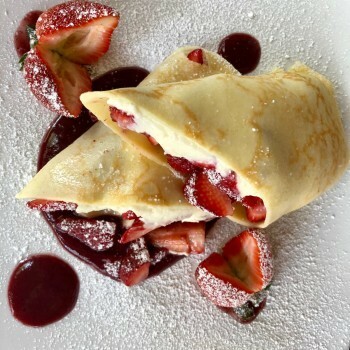 Vitaly is open daily for breakfast, lunch and dinner. 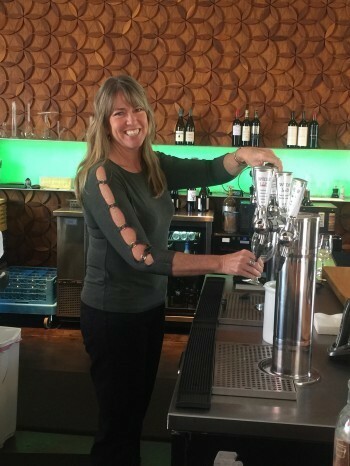 After a brief break at our hotel, we set out for the happy hour at Vaca, one of the most celebrated dining and drinking spots in Costa Mesa. 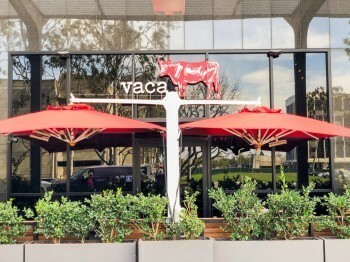 Owned and operated by Chef Amar Santana, famous from Bravo TV’s Top Chef, and his partner Ahmed Labbate, Vaca (meaning ‘cow” in Spanish) offers a wide range of inventive dishes inspired by authentic Spanish cuisine. Vaca has a lively vibe that is conducive to sharing good times with friends. We admired the huge cuts of prime meat in a cooler, although we focused on sharing a variety of imaginative tapas, such as Canelon de Pollo Ahumado, which is like an Italian cannelloni full of smoked chicken in a foie gras and sherry sauce—absolutely delicious with unique flavors. We also enjoyed Pan Con Tomate, toasted bread with garlic, olive oil and tomatoes. We savored a lovely charcuterie board and other creative dishes. I will definitely come back and try the enticing paellas. 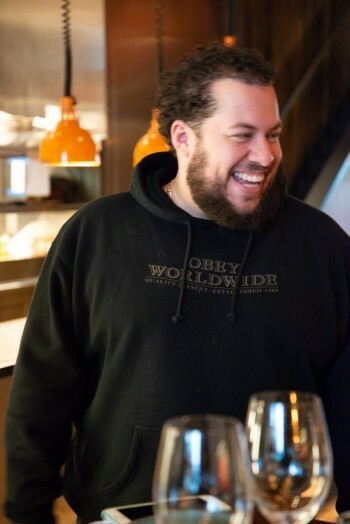 We were thrilled that Chef Santana came by and shared his passion for lovingly prepared food with us. He is full of good humor and obviously dedicated to providing a special experience for his customers. Vaca’s cocktail menu is also extensive and innovative. I was partiicularly attracted to the Spanish gin and tonic choices. I savored a drink called Earth, featuring Blue Gin by Hans Reisetbauer (Austria), Mixwell Dandelion Tonic, Sage, Caraway,and Grapefruit. I actually rarely see such unique and appealing cocktail options. If you like craft cocktails, I suggest taking Uber and trying a few. Dinner is served daily beginning at 5 p.m. Lunch is served weekdays from 11 a.m. to 2:30 p.m. The bar opens at 11 a.m. on weekdays. 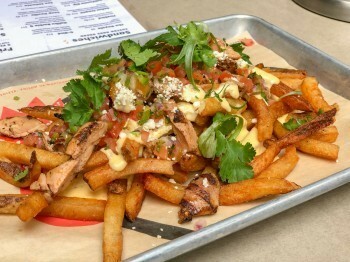 On Saturday morning we went to a surprising but wonderful choice for breakfast, The Crack Shack, which was opened in Costa Mesa last year by Bravo’s TV Chef All-Stars winner, Richard BLais, who had already opened two successful locations in San Diego. The affable restaurant manager, Renaldo Robinson, talked to us about the restaurant’s free-range sources of chicken without additives. Then he brought us an amazing sampling of tasty dishes, including Baja Chop, a salad featuring guacamole, radishes, cotija, and charred poblano dressing; Border Slaw, a delicious combination of papaya, mango, jicama, coconut, chili and pineapple; Firebird, a tangy sandwich on a potato roll made with spicy fried thighs, crispy onions, pickles and ranch dressing; and Mexican Poutine, a creative take on traditional poutine, with fries (of course), pico de gallo, pollo asado, and jalapeno cheese. Of course we also had spicy fried chicken and melt-in-your-mouth homemade mini biscuits. We enjoyed the good coffee, juices and welcoming casual atmosphere of this modern comfortable restaurant. The Crack Shack opens daily at 9 a.m. and closes at 10 p.m. or at 11 p.m. on Fridays and Saturdays. 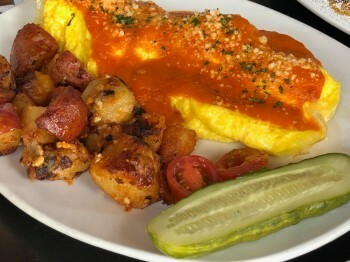 After this scrumptious breakfast, we walked around the bountiful Farmer’s Market, held every Saturday morning at SoCo and the OC Mix, an artsy shopping area that has restaurants, boutiques, and showooms. 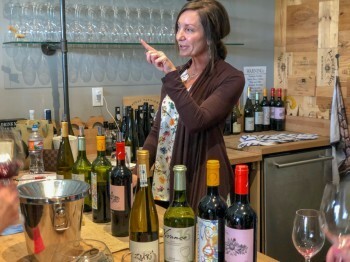 We ended up at LCA Wine, a wine retail outlet with wines from all over the world, that offers wine tastings and wine education. Knowledgeable Debra Parish led us through a Spanish wine tasting. I especially enjoyed the ZURI Getariako Txakolina 2016, which was crispy, fruity and so refreshing. Others in our group raved about the Quaderna Via Carbonica Tempranillo 2016 from Navarro Spain. These Saturday wine tastings feature different wines each week. LCA Wine is open every day but Monday. Check the website for specific hours. 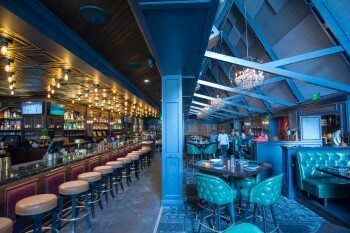 Our last stop was The Country Club, which just opened last December and has already made its mark as an intimate restaurant and bar exuding a private supper club ambiance with its dark wood and leather seating. Its location has been the site for good food and libations for more than 60 years. As an adults-only spot, this restaurant is the perfect place to relax with quiet conversation while sipping perfectly made cocktails. (This might be a good stop for a Match.com first date.) Chef Zachary Scherer brings extensive experience (such as from George’s on the Cove in La Jolla) and has created an appealing, diverse menu. I chose a beautiful salmon salad that was a crispy refreshing choice after our earlier chicken breakfast. Others in our group enjoyed Brioche French Toast, Short Rib Hash, Biscuits and Gravy, and a variety of savory benedicts. Also each week the chef features a special doughnut. 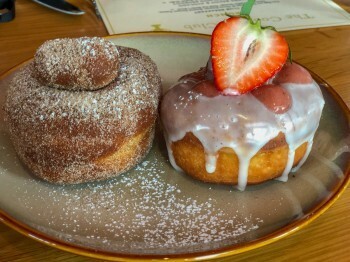 During our visit, we relished the strawberry rhubarb doughnuts—so scrumptious. The Country Club is open daily for dinner at 5 p.m, for Happy Hour weekdays from 3 p.m to 6 p.m., and for brunch on Saturdays and Sundays, 10 a.m. to 4 p.m.
Costa Mesa is not just a food mecca. Between meals and drinks, there is so much else to do. Costa Mesa is appropriately known as City of the Arts because of its many galleries and events that feature art, music, entertainment, and theatre. While our recent visit focused primarily on cuisine, I definitely want to come back to enjoy the entertainment, cultural and recreational opportunities that abound in this city. Disneyland is only 13 miles away. Newport Beach, Huntington Beach and Laguna Beach are all close by, along with numerous parks and golf courses. And nearby stylish South Coast Plaza offers shoppers an array of high-end shops, such as Sur La Table, where you could sign up for a cooking class. And the weather is almost always perfect. What more can you ask for in a magical getaway? Most of the photos with this article taken by Roger Paige.